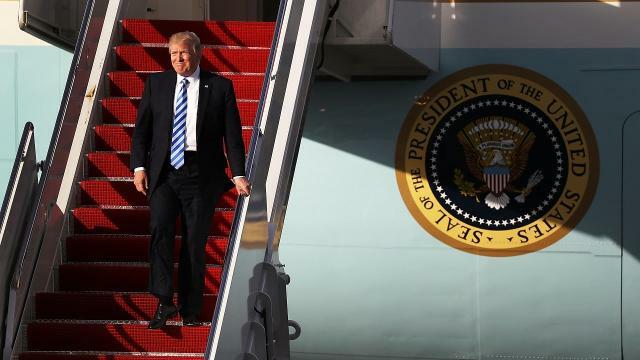 While Donald Trump’s 17-day vacation is certainly his longest yet, it’s only the latest of his many trips outside the White House. WASHINGTON — The Secret Service can no longer pay hundreds of agents it needs to carry out an expanded protective mission – in large part due to the sheer size of President Trump’s family and efforts necessary to secure their multiple residences up and down the East Coast. Secret Service Director Randolph “Tex” Alles, in an interview with USA TODAY, said more than 1,000 agents have already hit the federally mandated caps for salary and overtime allowances that were meant to last the entire year. Alles said the service is grappling with an unprecedented number of White House protectees. Under Trump, 42 people have protection, a number that includes 18 members of his family. That’s up from 31 during the Obama administration. The compensation crunch is so serious that the director has begun discussions with key lawmakers to raise the combined salary and overtime cap for agents, from $160,000 per year to $187,000 for at least the duration of Trump’s first term. “I don’t see this changing in the near term,” Alles said. Both Republican and Democratic lawmakers expressed deep concern for the continuing stress on the agency, first thrust into turmoil five years ago with disclosures about sexual misconduct by agents in Colombia and subsequent White House security breaches. While about 800 agents and uniformed officers were hired during the past year as part of an ongoing recruiting blitz to bolster the ranks, attrition limited the agency’s net staffing gain to 300, according to agency records. And last year, Congress had to approve a one-time fix to ensure that 1,400 agents would be compensated for thousands of hours of overtime earned above compensation limits. Last year’s compensation shortfall was first disclosed by USA TODAY. “It is clear that the Secret Service’s demands will continue to be higher than ever throughout the Trump administration,” said Jennifer Werner, a spokesperson for Maryland Rep. Elijah Cummings. Cummings, the ranking Democrat on the House Oversight and Government Reform Committee who was the first lawmaker to sound the alarm after last year’s disclosure that hundreds of agents had maxed out on pay, recently spoke with Alles and pledged support for a more permanent fix, Werner said. South Carolina Rep. Trey Gowdy, the Republican chairman of the House oversight panel, is “working with other committees of jurisdiction to explore ways in which we can best support” the Secret Service, his spokesperson Amanda Gonzalez said. Talks also are underway in the Senate, where the Secret Service has briefed members of the Homeland Security Committee, which directly oversees the the agency’s operations. Without some legislative relief, though, at least 1,100 agents – for now – would not be eligible for overtime even as one of the agency’s largest protective assignments looms next month. Nearly 150 foreign heads of state are expected to converge on New York City for the United Nations General Assembly. Because of the sheer number of high-level dignitaries, the United Nations gathering is traditionally designated by the U.S., as a “National Special Security Event” and requires a massive deployment of security resources managed by the Secret Service. That will be even trickier this year. “Normally, we are not this tapped out,” said Alles, whom Trump appointed to his post in April. The agents who have reached their compensation limits this year represent about a third of the Secret Service workforce, which was pressed last year to secure both national political conventions in the midst of a rollicking campaign cycle. 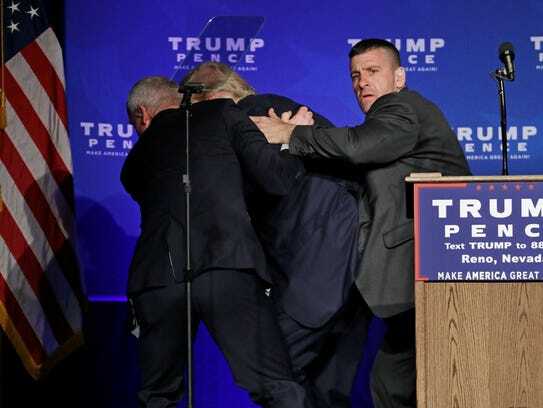 The campaign featured regular clashes involving protesters at Trump rallies across the country, prompting the Secret Service at one point to erect bike racks as buffers around stages to thwart potential rushes from people in the crowd. Officials had hoped that the agency’s workload would normalize after the inauguration, but the president’s frequent weekend trips, his family’s business travel and the higher number of protectees has made that impossible. Trump’s frequent visits to his “winter White House” and “summer White House” are especially challenging for the agency, which must maintain a regular security infrastructure at each – while still allowing access to paying members and guests. Always costly in manpower and equipment, the president’s jaunts to Mar-a-Lago are estimated to cost at least $3 million each, based on a General Accounting Office estimate for similar travel by former President Obama. The Secret Service has spent some $60,000 on golf cart rentals alone this year to protect Trump at both Mar-a-Lago and Bedminster. The president, First Lady Melania Trump and the couple’s youngest son Barron – who maintained a separate detail in Trump Tower until June – aren’t the only ones on the move with full-time security details in tow. Trump’s other sons, Trump Organization executives Donald Jr. and Eric, based in New York, also are covered by security details, including when they travel frequently to promote Trump-branded properties in other countries. A few examples: Earlier this year, Eric Trump’s business travel to Uruguay cost the Secret Service nearly $100,000 just for hotel rooms. Other trips included the United Kingdom and the Dominican Republic. In February, both sons and their security details traveled to Vancouver, British Columbia, for the opening of new Trump hotel there, and to Dubai to officially open a Trump International Golf Club. In March, security details accompanied part of the family, including Ivanka Trump and husband Jared Kushner on a skiing vacation in Aspen, Colo. Even Tiffany Trump, the president’s younger daughter, took vacations with her boyfriend to international locales such as Germany and Hungary, which also require Secret Service protection. While Alles has characterized the security challenges posed by the Trump administration as a new “reality” of the agency’s mission, the former Marine Corps major general said he has discussed the agency’s staffing limitations with the White House so that security operations are not compromised by a unusually busy travel schedule. Over time, Alles expects the Secret Service’s continued hiring campaign will gradually relieve the pressure. From its current force of 6,800 agents and uniform officers, the goal is to reach 7,600 by 2019 and 9,500 by 2025. For now, Alles is focused simply on ensuring that his current agents will be paid for the work they have already done.